Colours are a vital part of any brand. They indicate how serious or playful the brand is. Whether it represents a youthful image or something more grown up or dignified. The tone of the colour is often important to this end, where a bright orange might be paired with a dark orange for a particular effect. We often receive a design that uses a primary and secondary colour palette in the brand. In most cases, the secondary colours are only used as a highlight, and not intended for general use in presentations or reports. The standard Office palette is limited to 10 colours, and this is rarely satisfactory for many brands we work with. The ten colours do very specific things in Office, so it isn’t always possible to use them in the way you might think. For this reason, we can add a custom adaptation to the templates we build that allow the secondary colours to be manually applied. The main colour theme will be applied automatically, and used throughout the documents as the main colour rules, for headings and charts, for instance. The custom colours can be used to change things to fit the highlighted brand assets. This year’s column of turnover in a chart, a particular person’s entry in an org diagram, or a quote on a slide. 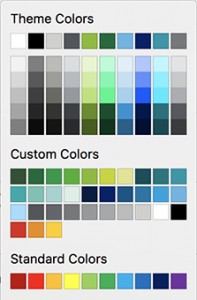 Please note that the Custom Colour palette is not supported in Office 2011 for Mac or Excel. There’s a limit to how many you can set up, but it’s sufficiently enough for even the most optimistic brand palettes. If you would like to add this to your new brand templates, give us a call.